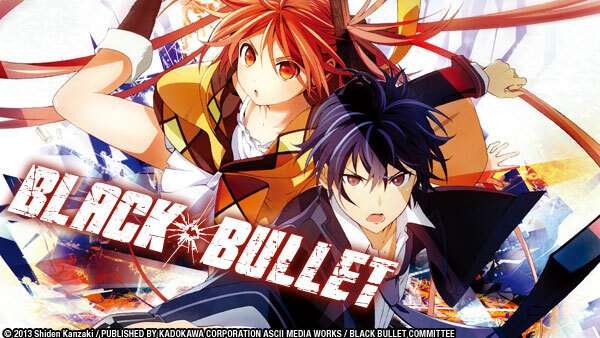 Sign up now to stream Black Bullet, subs, tons of dubs, OVA's, simulcasts, plus the all new Dubcast℠ editions and more! Rantaro, Enju and their president are invited to a secret meeting, where an unexpected guests makes his presence known in more ways than one. Cursed Children are the only hope left after the Gastrea nearly drove humanity to extinction. One Child, Enju, fights to protect those who hate her with her partner Rentaro. Enju and Rentaro reunite, but their moment is cut short by the mission at hand. During the mission, they encounter the mysterious masked man once again. Rentaro and Enju head deeper into the forest, and what they find not only goes beyond their mission, but may lead to more clues about the origins of the Gastrea themselves. A political backdrop adorns Rentaro and Enju's latest mission: protect Seitenshi from any and all danger, be it from well-known business figures or gun toting assassins. Though neither knows it, Rentaro and Tina's budding friendship is about to unravel as they both discover each other's identities in Tina's new mission. Enju is safe for now, but Rentaro will not stop until Tina is taken out. With another chance to assassinate Seitenshi, Rentaro finds the perfect opportunity for revenge. Fear grips the people of Tokyo as the monolith begins to turn white, and the civil officers discover something shocking as a result. Hope is diminishing as the Gastreas gain strength and bombs destroy the classroom outside. As the situation intensified, what can Rentaro do? Rentaro believes he is all alone in his fight with the Gastrea, but he gets a helping hand from an unlikely source when it is least expected.